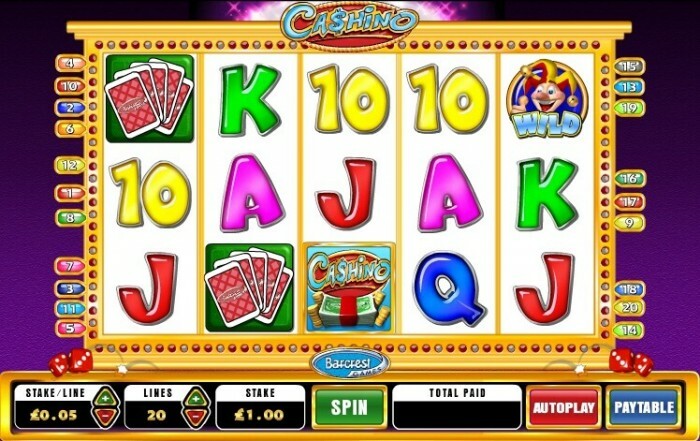 Cashino is a simple slot, with its five reels and three rows. Also, this slot both standard and theme related symbols. The standard symbols range from tens to aces, and the theme-related symbols include pictures of dice, roulette tables, jokers, playing cards, and money. To be precise, even the standard symbols could be considered theme-related. That is, most slots out there make use of standard symbols. Therefore, because of the casino theme, all the symbols used could be considered theme-related. Cashino also has a wild symbol, a bonus game, and even free spins. There are some slots out there that when playing you tend to forget you are playing at an online casino. However, this won’t happen when you are playing Cashino, as the theme of this slot by Barcrest is the casino. Everything in this slot is related the theme, and this emergence into this casino worlds make this slot very fun to play. The game has a very standard layout with five reels and three rows, which also adds to the experience of this game. Namely, you always now what is going on. Cashino is a simple slot, with its five reels and three rows. Also, this slot both standard and theme related symbols. The standard symbols range from tens to aces, and the theme-related symbols include pictures of dice, roulette tables, Jokers, playing cards, and money. To be precise, even the standard symbols could be considered theme-related. That is, most slots out there make use of standard symbols. Therefore, because of the casino theme, all the symbols used could be considered theme-related. This videoslot also has a wild symbol, a bonus game, and even free spins. Cashino has not one, but even two bonus games. The first starts directly after three sets of playing cards land on your reels. You have to select on of these three sets of playing cards to determine what your prize is. Technically, it is really easy how this works. Namely, you select one set to view the multiplier you receive. After having done this, the machine also shows you the value of the other sets. You get to play the other, second bonus game when three symbols of a roulette table show up. When you end up with a wheel position on your roulette, you are assigned a new table with higher potential winnings. 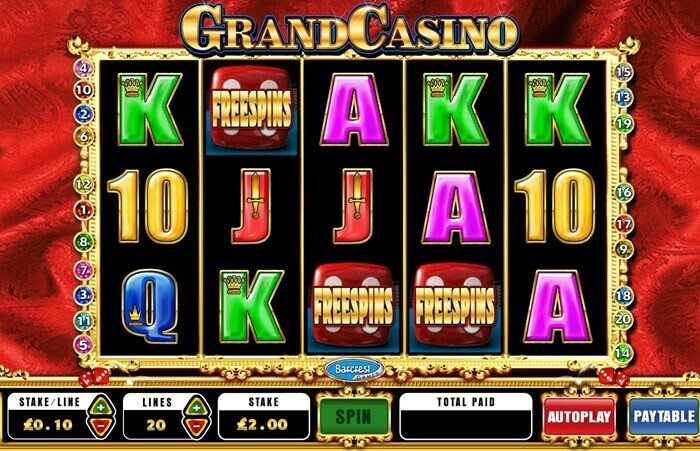 Cashino has free spins, and are executed in a quite similar fashion as the bonus games. When three sets of dice land on your turning wheels, you have to pick one set. When you’re lucky, you might even win 20 free spins. During free spins. you have an active multiplier. Also, there is a chance you might win even more free spins, during these rounds. Additionally, you can also unlock bonus games during free spins, making it a thrilling endeavor throughout the game. When you select the right dice, you could really win large sums of money during free spins. This slot has 20 pay lines, and if you find that too money, you’re in luck. Namely, you can alter the number of pay lines to play in Cashino. Furthermore, you can also alter the height of your wager. With all its free spins and bonus games, Cashino is a wonderful game by Barcrest, even though you might have to get used to the theme first. Therefore, we would definitely recommend playing Cashino for free first. In this way, to can find out what you yourself think of this slot, before pouring money into it. One thing we are sure about is that it is a slot of high quality. Cashino has a clear overview, is easy to comprehend while still being exciting, as it has all the extras a good game needs.